When the gold starts being trapped further down the length of the box, it is definitely time to clean up your box! Some miners like to clean up their sluice boxes after every hour of operation. Some prefer to do clean up at the end of the day. Others will go for days at a time before cleaning up. This is a matter of preference and seldom has much to do with the actual needs of the sluice box. Some of the large-scale operations, which ran during the early 1900’s used to allow the lower two-thirds of their boxes to run for months at a stretch without cleaning them up, and without very much concern about losing gold. However, it is true that sluice boxes were longer in those days. There is a method of determining when a sluice box needs to be cleaned up to keep it operating at its utmost efficiency. If the majority of gold is catching in the upper third section of the sluice box, then the recovery system is working well. After a sluice box has been run for an extended period of time without being cleaned, the riffles will have concentrated a large amount of heavy materials behind them. 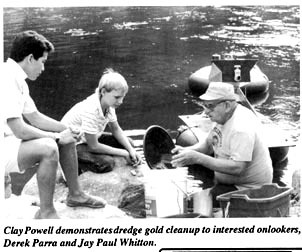 Sometimes a lot of heavy concentrated material in a sluice box will affect the efficiency of the riffles’ gold recovery. This is not always the case; it depends on a number of different factors, like the size and shape of the gold, the size and type of riffles being used and how they are set up in the box. The true test of when a set of riffles is losing its efficiency because of being loaded down with heavy concentrates is when the gold starts being trapped further down the length of the box than where you are comfortable seeing it. When this occurs, it is definitely time to clean up your box. Otherwise, clean them whenever you like. Expanded metal riffles, being short, will tend to load up with heavy black sands faster than the larger types of riffles. But shorter riffles generally concentrate fine gold better than deeper riffles. A large, visible amount of black sand being present is not necessarily a sign that you are losing gold. Gold is four times heavier than black sand. In some cases, the black sand will have little effect on gold recovery. Again, it depends on how the system is set up, the type of material being run, the purity (and therefore weight) and shape of the gold, as well as other factors. The best way to evaluate your recovery system is by direct observation of where the gold is being trapped.